Jordi Murphy comes in for the injured opensides for the final day clash with Treviso. Garry Ringrose and Johnny Sexton will start against the Italians. DESPITE HOLDING OUT hope of having the powerful openside back in harness before the Pro12 play-offs, Leinster’s Sean O’Brien is still not fit to return to competitive rugby. The Tullow Tank suffered a severe hamstring tear in Ireland’s Six Nations defeat to France and the province had hoped he would get some match minutes under his belt before the knock-out fixtures this month. “Seanie had the high hamstring tear, which can be complicated,” head coach Leo Cullen said at the RDS this afternoon. The man who profited most from O’Brien’s absence, Josh van der Flier, will also sit out tomorrow’s season finale at home to Treviso (kick-off 3pm). The Wicklow man is nursing a damaged ankle following last weekend’s 30 – 6 loss to Ulster. Luke Fitzgerald ‘tweaked’ the medial ligament in his knee, but Cullen is hopeful that the Lion will be fit again when the semi-finals come around. Jordi Murphy fills the number seven jersey in place of Van der Flier with Dominic Ryan on the bench. There are three other changes to Leo Cullen’s starting line-up with Mike Ross, Eoin Reddan and Mick Kearney coming into the fray. The province report that, so far, 13,800 tickets have been sold for the non-televised final day fixture. 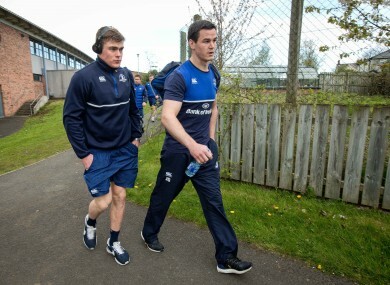 Email “Van der Flier and O'Brien absent as Leinster look to finish with a flourish”. Feedback on “Van der Flier and O'Brien absent as Leinster look to finish with a flourish”.